An individual’s face is the primary point of focus for everyone. Healthy skin and a great complexion help build confidence and promote a more outgoing personality. Whether walking down the street or standing in front of an audience presenting a speech, healthy skin stands out as an individual’s trademark. This trademark is a direct reflection on how one takes care of oneself and Sasha Cosmetics makes sure you always look your best. Berlanti Active Serum is a new supplement to the program. Active Serum contains Vitamin C to enhance the benefits of the regular program and it will reactivate the Mother cell to produce 35 to 40 % of your own collagen, this will put a stop to importing any foreign Collagen into your skin. People over the age of 35 years old, their mother cells have stopped production of collagen; now with the use of Active Serum, they have the opportunity to reproduce their own Collagen. 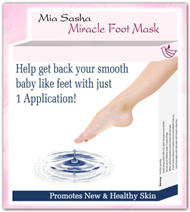 After years of research and experience in manufacturing skiing care products, it brings us great joy to announce the launch of our latest formulation, the Mia Sasha Miracle Foot Mask. Unlike most formulations on the market today, the Miracle Foot Mask does not contain the potentially harmful ingredient salicylic acid. In line with our belief in the superiority of using sad and natural compounds, our Miracle Foot Mask uses herbal extracts to achieve optimum results. Further, our newest product fundamentally change the way foot care functions, making the process more expedient and practical. Berlanti Cosmetics has added another method to traditional topical application Click for larger view for skin correction and restoration program, that is the approach from within. Its aim is to re-awaken or re-activate the enzymes to do each of its intended functions. Join the Team that is "dedicated to the Empowerment of Network Marketing Professionals Worldwide. Are you tired of paying thousands of dollars or more for proper internet marketing coaching? Here at Pure Leverage we will teach you everything you need to know to build a very comfortable business from home in the direct sales industry. In fact, we guarantee you can be in profit in less than 30 days. The Ultimate Portable Make-up Studio has just arrived. This fabulous case can be purchased filled or unfilled. Filled kits are available in Light, Medium, or Dark Skin Tones. be purchased filled or unfilled. Filled kits are available in Light, Medium, or Dark Skin Tones. This freestanding case comes complete with it own lights, mirror and electrical outlet! Complete self-contained “Studio”. Until now, there was no effective make-up tool to guide and train estheticians and make-up artist to practice make-up applications effectively and beautifully on different skintone women. 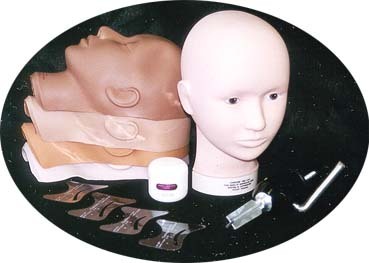 The Multicultural Make-Up Mannequin Tool Kit, which contains a basic flat-back mannequin head, can be laid down on a flat surface with the face looking upward, or positioned upward with the support of an adjustable mannequin holder clamped to the edge of a table facing you. The contour of the facial structure of the mask is oval shape with short nose bridge, wide nose, short chin, heavy lidded eyes, thin lips, and buffed out cheeks that give you the fundamental features to learn how to shadow the way you want to with the magic of make-up. We're sure you will find this kit beneficial, educational and fun to work with. bikini irritations, Acne, and Keloids. It is recommended that one of the listed moisturizers be used to help promote healthy and moisturized skin. Skin Tight Razor Bump Ointment helps eliminate and prevent ingrown hairs, razor bumps and razor burn while enhancing the overall condition of the skin and offers men and women the relief they desire when suffering from these irritating skin conditions. Skin Tight is formulated with Tea Tree Oil, a traditional herbal antiseptic that soothes irritated skin, and Willow Bark Extract, which gently exfoliates the skin and clears the pores. Some dermatologists suggest wetting the beard area before shaving, therefore Skin Tight can also be used as a pre-shave treatment in addition to being used after the beard area has been shaved. Or click on the Gift Box for additional options. Copyright © 2014 - B&B Marketing Group TM All rights reserved. BBMG is not responsible for typographical errors.